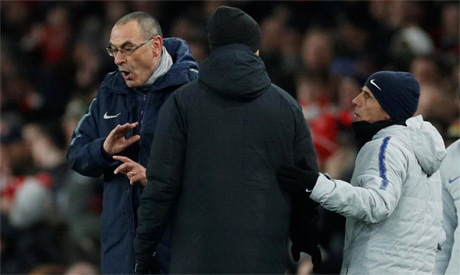 Angry Chelsea manager Maurizio Sarri accused his players of lacking determination and being “difficult to motivate” after watching their lacklustre 2-0 defeat away to London rivals Arsenal in the Premier League on Saturday. When he eventually emerged from the dressing room the Italian insisted on delivering his post-match comments in his native language in order to fully express his bitter disappointment with his team. “I prefer to speak Italian today because I want to send a message to my players and I want it to be very clear,” the 60-year-old former Napoli coach began before switching to Italian. The translation would not have made pleasant listening for his players who despite bags of possession at the Emirates were blunt in attack and casual in defence and could have conceded more in a first half dominated by Arsenal. “I have to say that I’m extremely angry because this defeat was due to our mentality,” he said through a translator. “We played against a team that mentally was far more determined than we were and this is something I can’t accept. “We had the same issue as this at Tottenham and we spoke frankly about that particular loss. I thought we had managed to overcome this issue. But it seems we have an issue of having the right amount of determination and being mentally strong. Chelsea remain in fourth place but are only three points above Arsenal and Manchester United after goals by Alexandre Lacazette and Laurent Koscielny condemned his side to defeat. With Liverpool and Manchester City battling for the title, it leaves Chelsea, Tottenham Hotspur, Arsenal and United scrapping for third and fourth places. Sarri appeared to question whether his side have the stomach for the dogfight. “Today I could see that one team was quite obviously more determined than the other,” he said. “It was not about tactics. From a technical point of view the two teams were pretty much on the same level today. But their higher level of determination was pretty obvious, particularly in both penalty areas. Asked if he could change the mentality of his team, Sarri did not sound convinced. “That’s a difficult question,” he said. “It seems that as a group of players they are not particularly aggressive from a mental point of view and they don’t have the kind of ferocity and that’s to do with their characteristics. With a 1-0 deficit to overturn against Tottenham Hotspur in the League Cup semi-final second leg on Thursday, Sarri hopes some hard truths can be expressed this week. “They cannot be afraid to face up to their own responsibilities,” he said. “They should be able to come and talk to the coach about mistakes that have been made or issues that have arisen. If any player is afraid of that then they should not be playing at this level.